In the final seconds before the opening kick-off of Tuesday night’s UEFA Champions League opener between hosts FC Barcelona and Celtic FC, Lionel Messi, Neymar Jr, and Luis Suárez stood together in the center circle. Yet they didn’t exchange words; their body language did all the talking. They slapped hands, cracked their necks, and fidgeted away like a trio of prize fighters, each one anxious for the opening bell of a top-rank title bout. It was the first time all three were in the starting line-up this season, and tonight was going to be all business. The match was less than three minutes old when Messi landed the first blow, meeting a brilliant Neymar through ball in stride, on the left side of the Celtic area. Unopposed, and needing only to beat the goalkeeper from point-blank, Messi was merciless, sending a close-range screamer past the literally defenseless Dorus de Vries and into the upper right corner. At the opposite end FC Barcelona goalkeeper, Marc-André ter Stegen gave Celtic a glimmer of light on 24 minutes when he tripped up MoussaDembélé in the penalty area, drawing a yellow card and gifting Celtic a spot kick. Ter Stegen, however, made quick amends, guessing right — and diving right, as well — to parry Dembélé’s kick and keep Barça in the lead. Messi landed another thump in the 28th, tapping in another feed from Neymar — this one just steps from the goal line — giving Barça a 2–0 lead. The goal gave Messi his 85th all-time in the Champions League, as well as his 19th career double in the continent’s top club competition. The intermission came but it offered the Scots no respite from the Trident’s lethal surge. Five minutes after the start the second half Neymar delivered a right hook, firing a free kick — Messi drew the foul — from 20 meters, over the Celtic wall and into the upper left corner. Barça had a 3–0 lead and were looking for the knockout punch. In the 59th, Celtic were thumped once again. Neymar’s third assist on the evening was a running cross from the left wing that hit a streaking Andrés Iniesta in stride. Iniesta executed a textbook volley that, to de Vries, was little more than a blur. In the 60th, Messi notched a third — his 6th hat trick all-time in the Champions League — sliding to redirect a pass from the boot of LuisSuárez into the back of the net for a 5–0 lead. 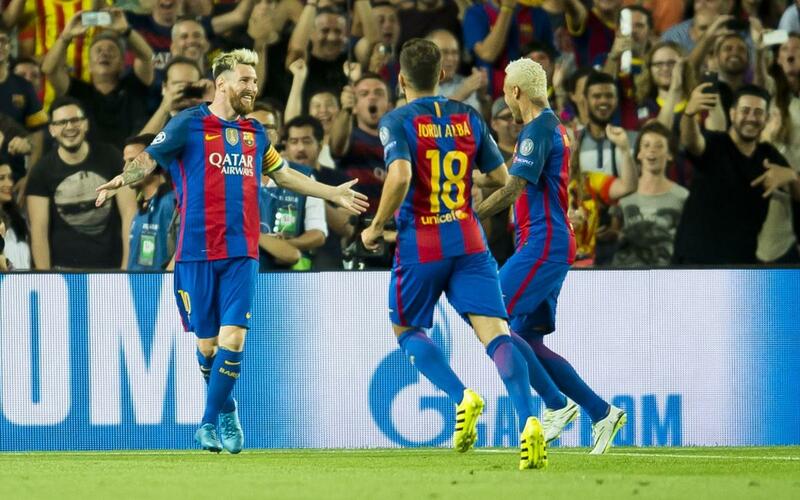 Now that Suárez had contributed with an assist, it was time for him to score. Neymar took it upon himself to find Suárez, who was lurking around the six-yard box. In the 75th minute, the blonde-haired Brazilian floated a pass into Suárez much like an NBA point guard would feed a power forward camped out on the low post. Suárez, back to the goal, cradled the ball with his chest, so softly it could have rocked a crying baby to sleep. A split-second later, as the ball floated earthward, Suárez pivoted around and one-timed his self-pass with a side volley so powerful that it left the net trembling in fear. Yet, with a 6–0 lead, finished they were not. Suárez notched his second goal of the game in minute 88, slipping a rolling cross from Messi past de Vries for the definitive, 7–0 final score. Tuesday night’s triumph not only equalled the biggest victories ever recorded in the Champions League, but it was also Barça’s twelfth straight at home in the tournament.